One of the goals of my site is also to gather together people from all disciplines and walks of life who are interested in Shelley. One such person is Mark Summers. You have encountered his writing on my site: The Political Fury of Percy Bysshe Shelley and Revolutionary Politics and the Poet. Mark Summers came late to Shelley - he first encountered him when the newly discovered Poetical Essay on the Existing State of Things was published for the first time in late 2015. But he was a quick learner, and I think he has a better sense of Shelley than many people who have been studying him for thirty years. Mark is an e-Learning specialist for a UK Midlands based company and a musician specializing in experimental and free improvised forms. An active member of the Republic Campaign which aims to replace the UK monarchy with an accountable head of state, Mark blogs at at www.newleveller.net which focuses on issues of republicanism and radical politics and history. You can also find him on Twitter @NewLeveller. Mark's writing has a vitality and immediacy which is exhilarating. What I love most about it is his ability to put Shelley in the context of his time, and then make what happened then feel relevant now. Both Mark and I sense the importance of recovering the past to making sense out of what is happening today. With madcap governments in England and the United States leading their respective countries toward the bring of authoritarianism, Shelley's revolutionary prescriptions are enjoying something of a renaissance; and so they should, we need Percy Bysshe Shelley right now! One of Mark's dreams was to "take Shelley to the streets". There has been a long history of this, most recently during the Occupy Wall Street demonstrations. 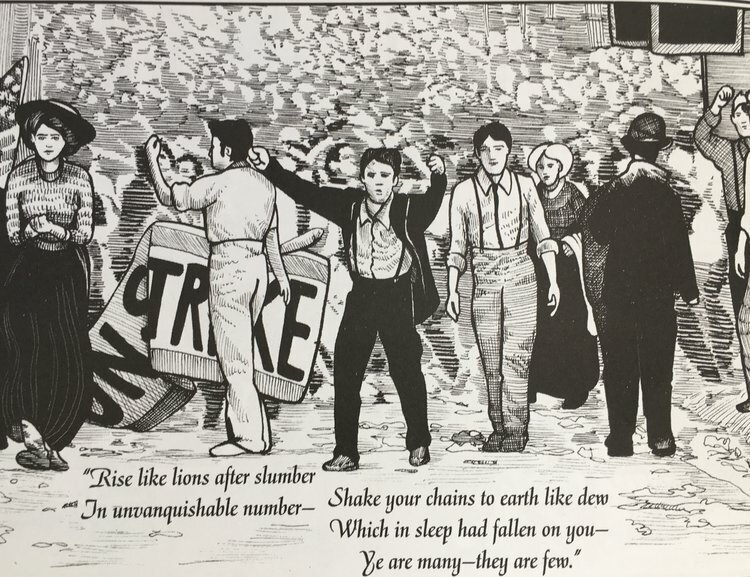 Then there was the early 20th Century union organizer Pauline Newman who deployed Shelley's poetry to great effect while founding the International Ladies' Garment Workers' Union. I wrote about that in Masks of Anarchy by Michael Demson. I also recently reported on a highly unusual but effective use of Shelley's The Mask of Anarchy by English fashion designer John Alexander Skelton: Shelley Storms the Fashion World With Mask of Anarchy. Well, last fall Mark Summers did something absolutely fantastic: HE ACTUALLY TOOK SHELLEY'S POETRY TO A STREET PROTEST. What follows is his moving account of his experience. There are lessons for all of us in his experience - including some very practical ones such as the correct use of a megaphone! I think Mark's article is one of the most important I have published - and every student or teacher of Shelley needs to pay close attention to what Mark did. It is easy for us to chat amiably about Shelley in seminar rooms or at conferences, to comment on our FaceBook pages or Twitter accounts - it is entirely another thing altogether to go to a protest and read Shelley aloud to demonstrators. Yet this is EXACTLY how I think Shelley would have wanted his poetry to be heard. The closest I have come to Mark's experience pales in comparison: I have taken to working Shelley into all my speeches. And what I have taken away from the experience is very similar to what Mark learned. So grab a coffee or a whiskey (or both) and settle in for a terrific read. Deciding that road transport and parking would be a nightmare I took the train into Birmingham. It was an almost surreal experience as protestors laden with banners, flags and leaflets rubbed shoulders (literally in the case of a crowded train) with conference delegates in suits and carefully coiffured hair!. I had chosen my poems beforehand, England in 1819, Masque of Anarchy and Poetical Essay on the Existing State of Things. Three of the most radical and hard hitting of Shelley’s pieces. The major problem I needed to overcome was a total lack of experience of poetry recitation! My original plan had been to include some stanzas from the great chartist poets such as Gerald Massey. Gerald Massey, Chartist, mid 1850's. From Samuel Smiles' Brief Biographies, 1876. But powerful as these works are (I must get around to writing about them very soon) they proved far trickier for a novice to handle than the fluid lines of Shelley. Considering the fact that I was also using a megaphone in a restless crowd I decided to play safe by letting the words of the poems do the work. As a shorter sonnet, England in 1819 was suitable for reading in its entirety. But the longer poems needed more careful consideration. One of the delights of reading both Mask of Anarchy and Poetical Essay at your leisure is the way in which Shelley structures his material, diverting now this way, now that way to provide background and develop his theme. This would simply not work for a shifting crowd where the aim is for impact in an environment with competing demands for attention. The best plan would be to choose portions in the hope of hooking people in to discover more. Selecting the material from Mask of Anarchy was a relatively straightforward task with Shelley deftly creating distinct points of tension within its tripartite structure. This means that groups of 10 or 12 stanzas are distributed through the poem which have both internal coherence and impact. So, for example, the following section works as a unit, especially as it contains one the most famous lines in radical poetry "Ye are many—they are few." Image from Michael Demson's Masks of Anarchy, a brilliant graphic novel that can be purchased here. Will I continue – absolutely! The sense of catharsis may have just been simply the result of over-oxygenation of course, but the surge of energy was wonderful. It was also a humbling experience to be a vessel for ideas and emotions far beyond my own abilities to articulate. I felt a great sense of connection, as though the past two centuries had simply evaporated and the man himself was still amongst us. I discovered patterns and connections which had not occurred to me when reading the material quietly and alone. I hope Shelley would have approved of what I had done to his poetry. For me the work of Shelley is not an artifact to be studied and analyzed but a continuing personal inspiration for my political engagement. I am sure it will be the same for many more people when we release him from the sanitized, gilded cage in which the establishment has trapped him. Let me tell you something Mark, Shelley, who went to his grave without seeing Mask of Anarchy published, would be overjoyed. Overjoyed because he wrote his poetry to inspire people to change the world the way you have been inspired. But I think his joy would be profoundly tinged with sadness, a sadness which stems from the realization that the world has not changed so very much from his times; the poor are still oppressed, and the rich have grown ever wealthier. Shame on us all. Mark's article can be found here at his terrific website, New Leveller. It is reprinted with his permission. The banner image at the top of the post comes from Michael Demson's Masks of Anarchy, abrilliant graphic novel that can be purchased here.